Windows 95 is the operating system that’s now used as a yardstick for what’s possible on modern devices and platforms. We’ve seen Microsoft’s popular OS appear on the Apple Watch, an Android Wear smartwatch, and even the Xbox One. Today, someone has gone a step further and made Windows 95 into an app that you can run on macOS, Windows, and Linux. 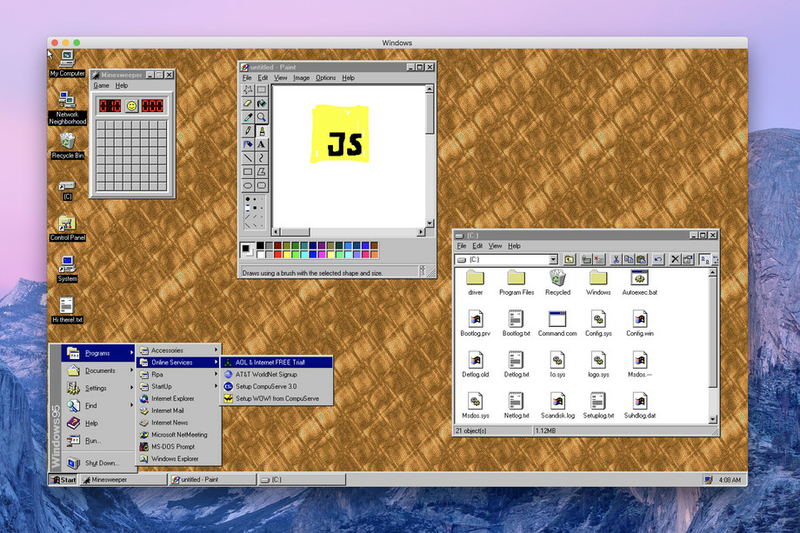 Slack developer Felix Rieseberg is responsible for this glorious app, based on an existing web project that supports Windows 95, Windows 98, and a whole host of older operating systems. Now nostalgia lovers can play around with Windows 95 in an electron app. Rieseberg has published the source code and app installers for this project on Github, and apps like Wordpad, phone dialer, MS Paint, and Minesweeper all run like you’d expect. Sadly, Internet Explorer isn’t fully functional as it simply refuses to load pages. The app its only 129MB in size and you can download it over at Github for both macOS and Windows. Once it’s running it surprisingly only takes up around 200MB of RAM, even when running all of the old Windows 95 system utilities, apps, and games. If you run into any issues with the app you can always reset the Windows 95 instance inside the app and start over again. Enjoy this quirky trip down memory lane.